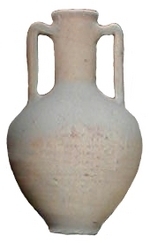 The top half of this type appears to be exactly the same as a normal Dr. 2-4 type, with simple bead rim, long neck and bifid handles. However, the body is much shorter, is ovoid in shape with widening shoulders and ends in a flat base rather that a spike (Panella & Fano, 1977). It may be copying the flat based amphorae from Gaul (Panella, 2002). The fabric in all of the examples seen by the writer indicates a Pompeiian origin. The only complete examples seen by this contributor (DFW) comes from Pompeii. However, given that the top half is exactly the same as the normal Pompeian Dr. 2-4 form, breakages could made this harder to recognise, meaning that its distribution could be much wider than is currently apparent. Wine. Its capacity is about half as much as a normal Dressel 2-4, c. 10-12 litres (Peacock & Williams, 1986).